Thank you for your interest in our practice. First Internal Medicine has changed to a membership based model (also called 'concierge medicine'). This document describes how to become a patient in the practice. This document compares VIP Care concierge medicine program with the 'best care known to your health insurance'. By signing this Agreement you will enroll in our Personal VIP Care Membership Program through which we can provide you the highest level of care available exclusively to our VIP members. These forms must be completed by all new patients, even if you complete your medical information online. Please bring the completed and signed forms to your first appointment together with your insurance card and a picture ID. Complete this form only if you are unable to update your medical history and current medication list through 'Patient Access' on this website. To set up your account, please contact the office. Use this form to request records from your previous physician(s) to be sent to us. 'Patient Access' is your information gateway to our office. Please read this overview of what functionality is available. To obtain your login information, please contact our office. Federal privacy regulations (HIPAA) require us to have a signed authorization before we can send your medical records to another physician. Please complete this form and return it to us via mail or fax (303) 706-1900 if you wish to have your records sent. Please use this form if you wish to receive a copy of your medical file for personal use. This document outlines our office policy regarding providing a copy of the records to another organization for purposes other than medical care. Health Insurance Portability and Accountability Act (HIPAA) gives you, the patient, the right to inspect your medical records or to request changes/amendments. If you wish to do so, please send us this form. Driving direction to our new office. Please note that Google maps want you to drive around. 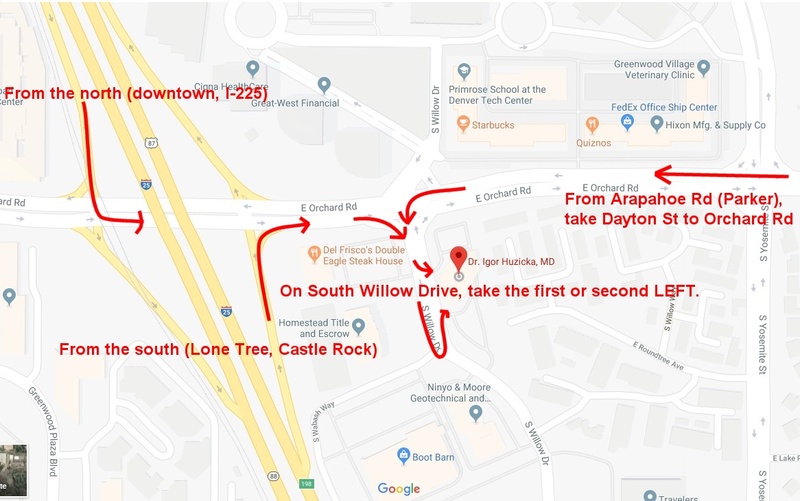 Right or left turn from Orchard Road to South Willow Drive and then first or second LEFT TURN to our building (look for Independence Bank sign) is much easier.